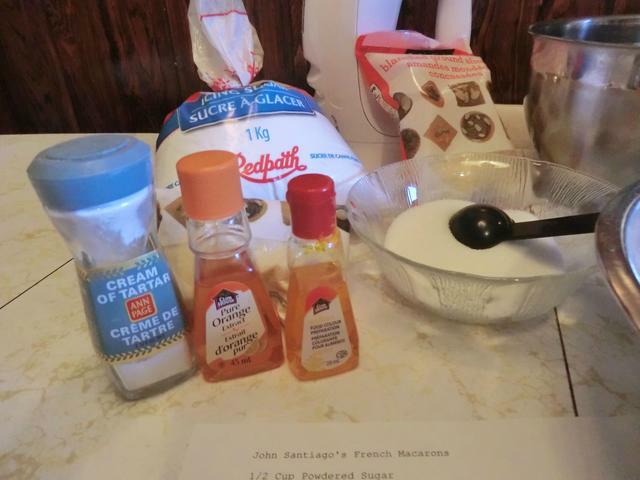 November | 2015 | Cooking is Fun … Really!! 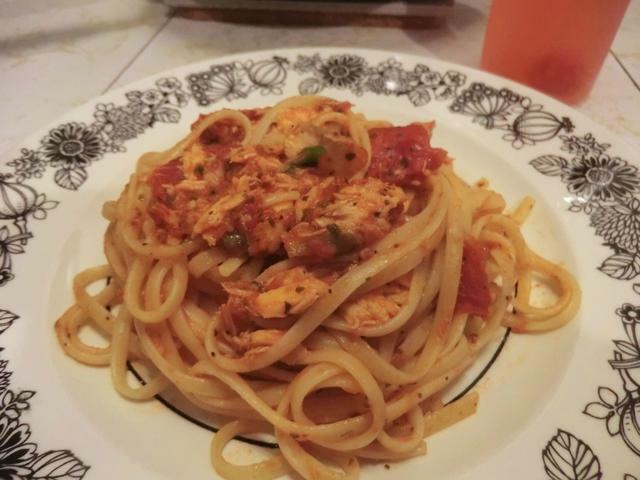 I’ve been doing quite a bit of cooking from my freezer these days due to necessity. No money and free time means I can get creative. 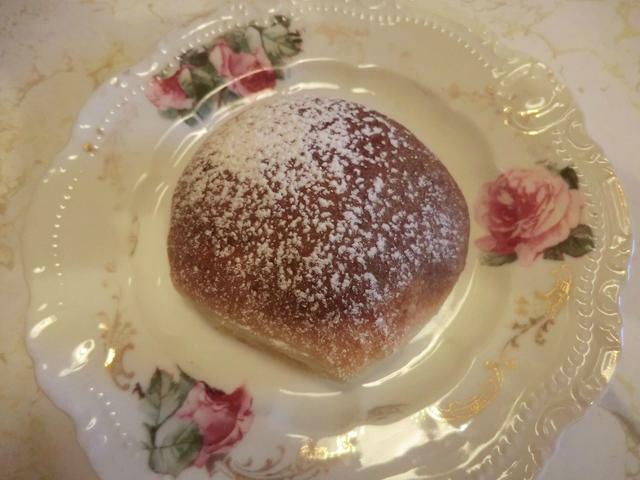 I love dim sum and one of my favourite dishes is char siu bao or Chinese bbq’d pork buns. 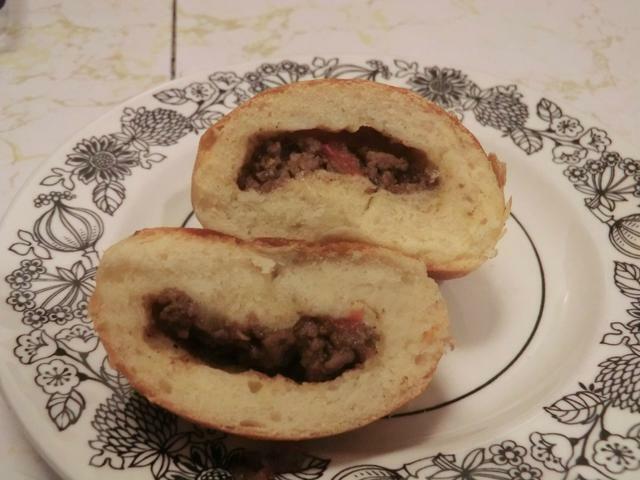 I was going to use the Korean pork tenderloin for a filling but I was too lazy to do so when I had a container of Jamaican beef patty filling in the freezer, so I used that instead. 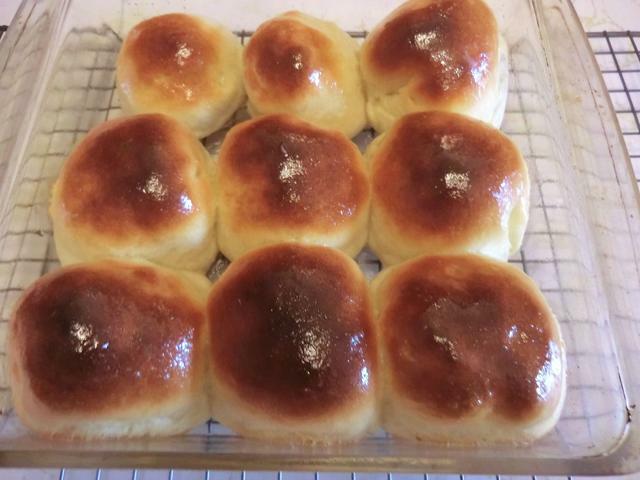 I ended up making 2 batches (24 buns total) to use up all the thawed filling. 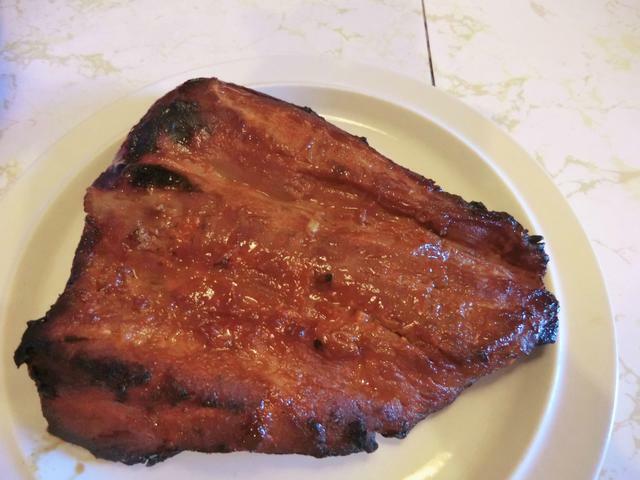 Next time I’ll try for something more traditional with my own Chinese bbq’d pork. 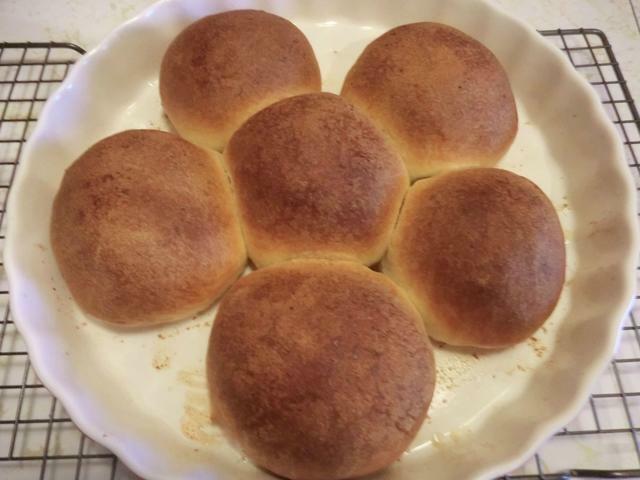 The buns were a definite winner. 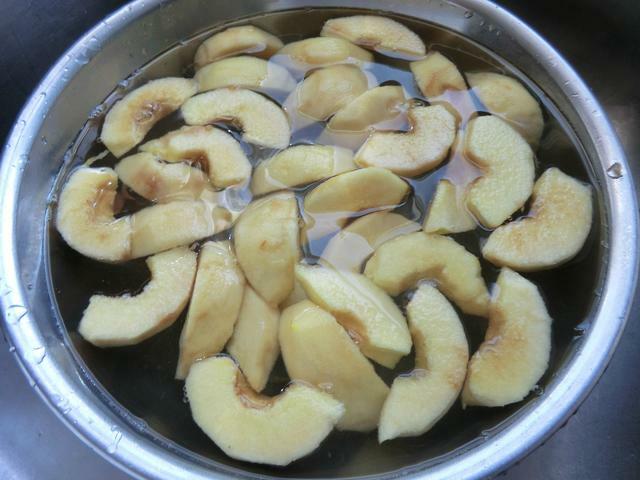 Place the sugar and warm water in a small bowl, mix until the sugar has dissolved. Add yeast and leave it for 10 – 15 minutes until it becomes all frothy. Add the yeast mixture, beaten egg, oil and salt and stir. 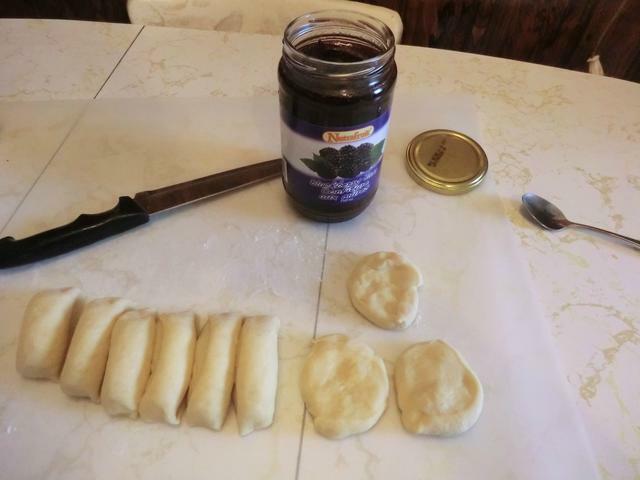 Bring the flour mixture together with a fork or your hands. 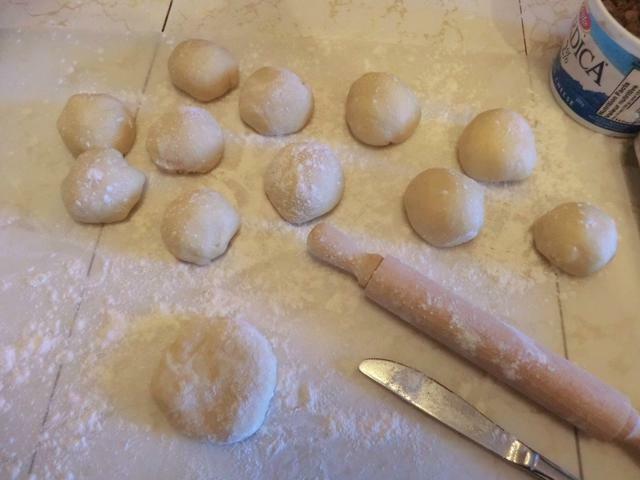 Place the dough on a lightly floured surface and knead for approximately 10 minutes. Use as little flour as possible for kneading. 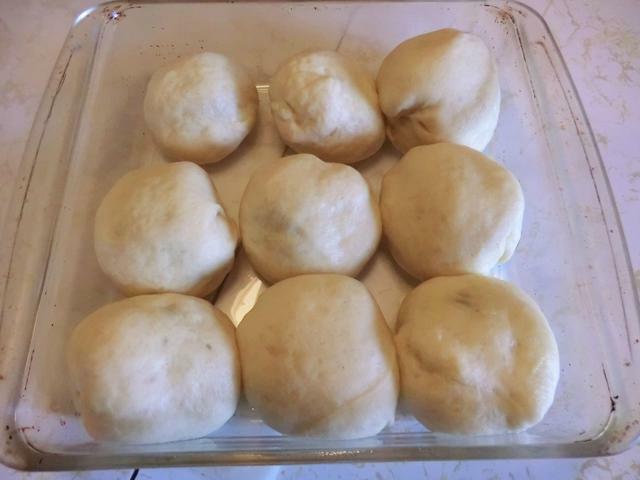 The dough should be smooth and slightly elastic. 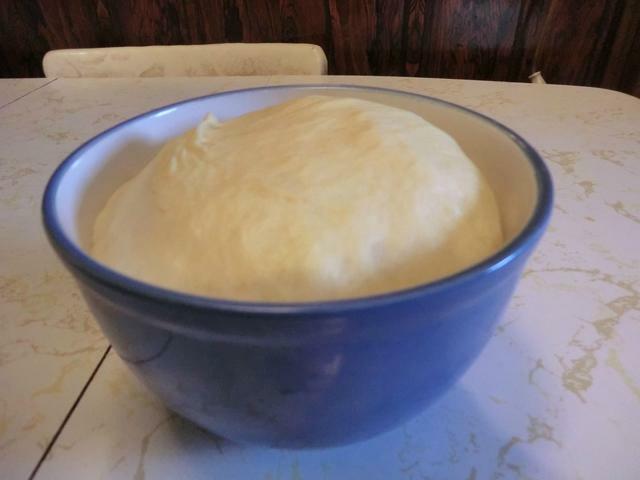 Place the dough in a lightly oiled bowl and cover with a damp cloth. Leave to rise until it is double in size. 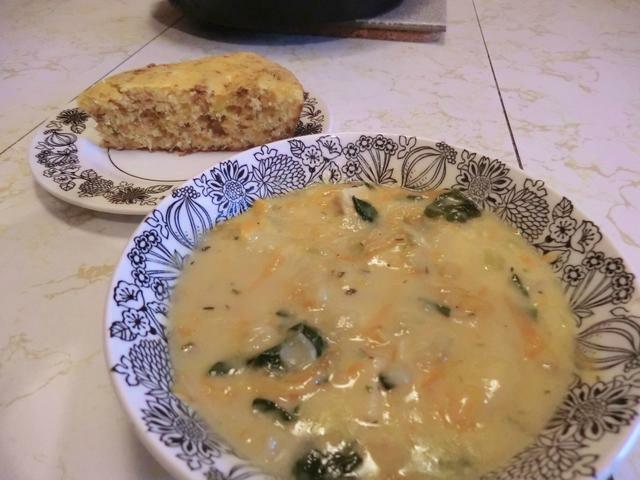 This will take from 1 – 2 hours depending on the temperature in your kitchen. 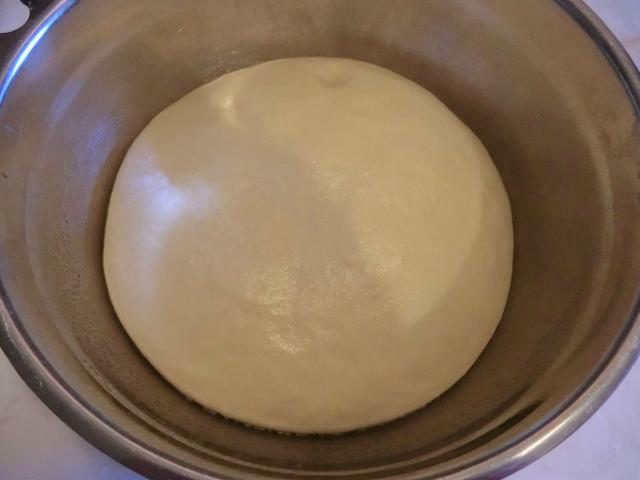 Once dough has doubled in size transfer to a working surface over which you’ve scattered some flour. 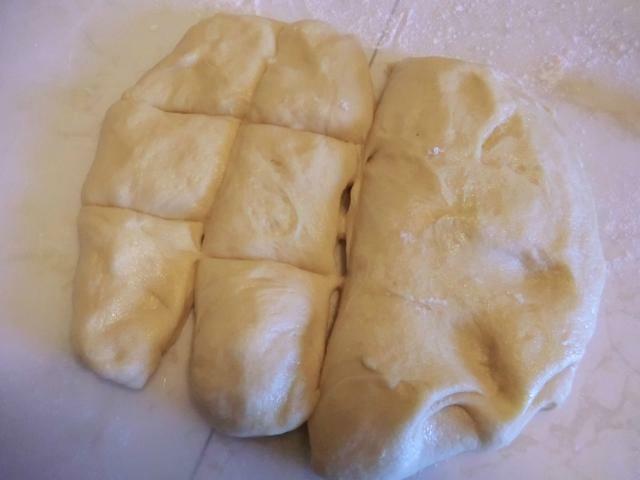 Deflate the dough a bit and divide into 12 equal portions. 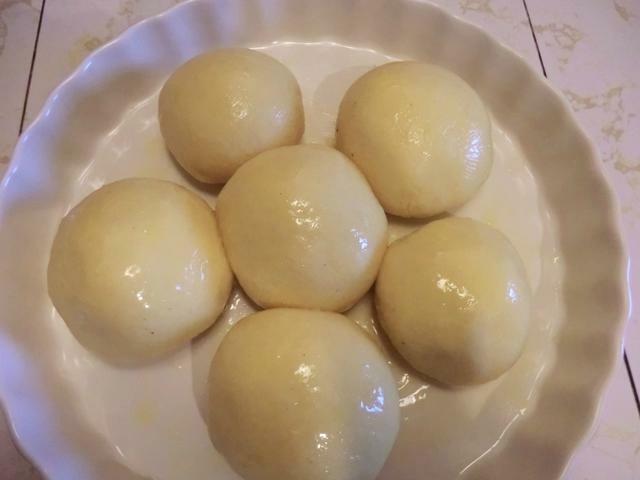 Shape into round balls. 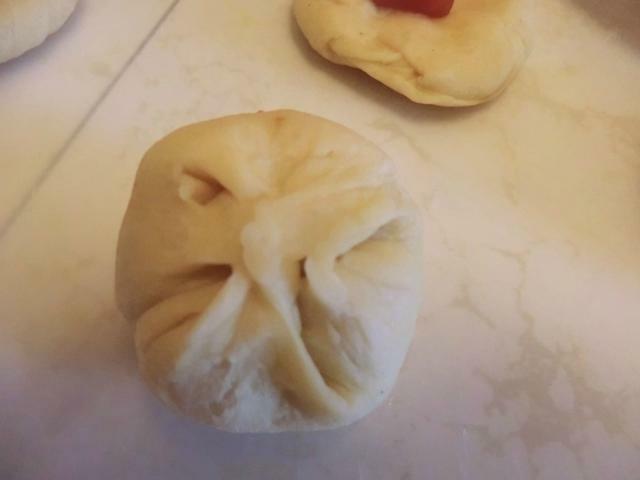 Place a good sized tbsp of filling on the dough circle. 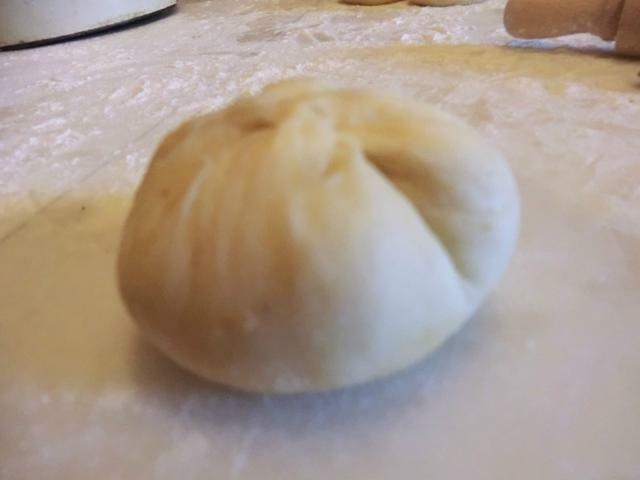 Then gather the edges and seal your bun. 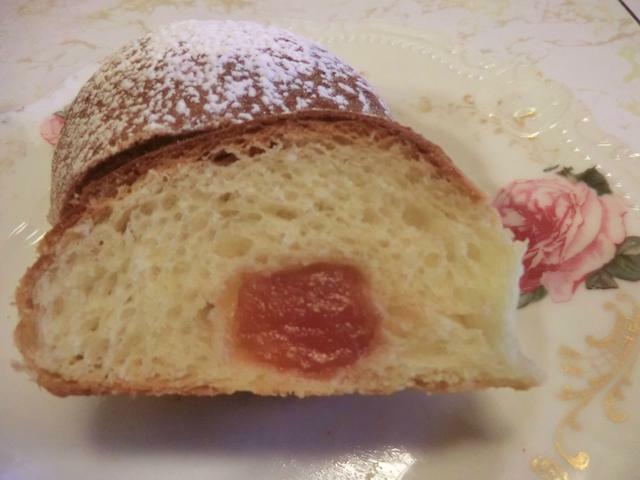 NOTE: Alternatively, press the ball of dough down with the heel of your palm, put the stretched dough into your left hand and add the filling. 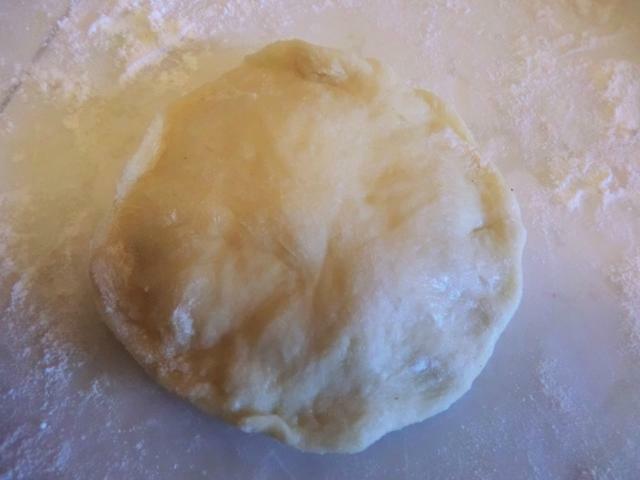 Use the thumb of your left hand to press down on the filling while using the thumb and first two fingers of your right hand to draw the edges of the dough up around the filling. 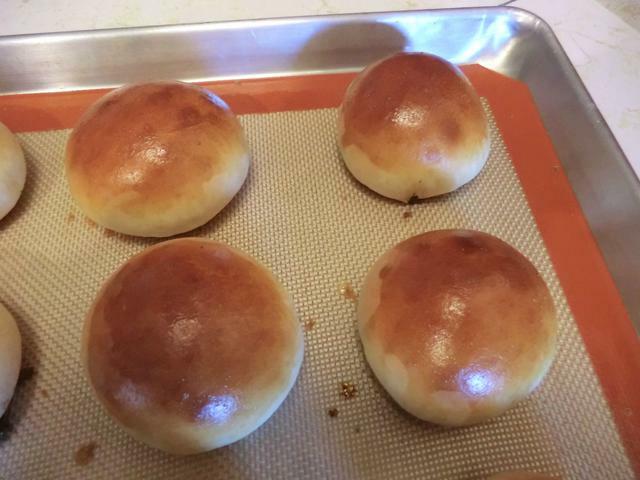 Place the bun sealed side down on your baking sheet. 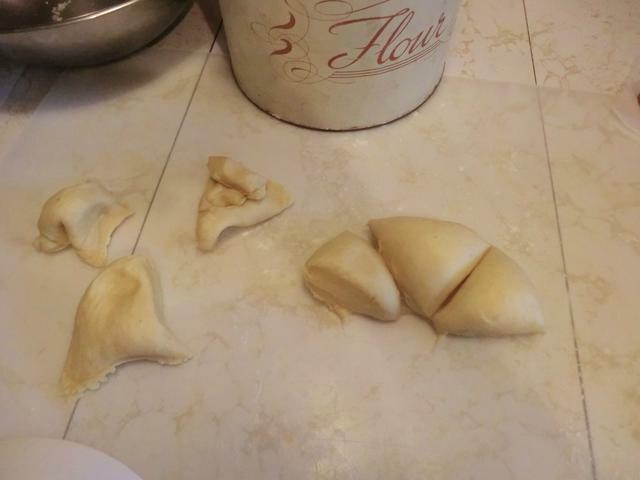 Continue with the rest of the dough. 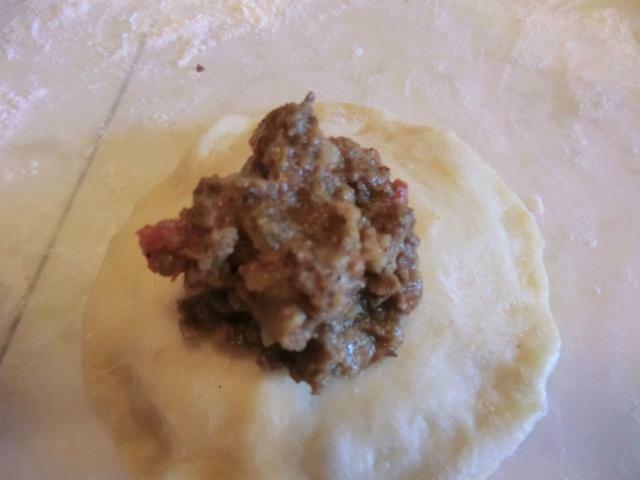 (You can press down on the balls gently so the bun won’t be too bread-y on the top and the filling will more centered. See picture below. ) 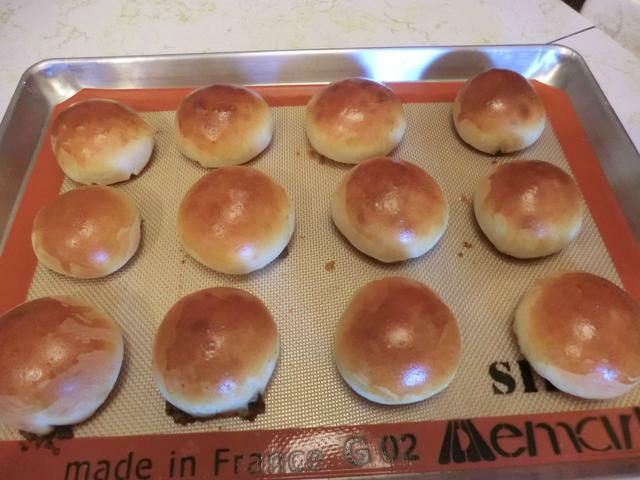 Once all the buns are finished, brush the surface with egg wash.
Place in a preheated oven of 400º F for 15-18 minutes or until golden brown. 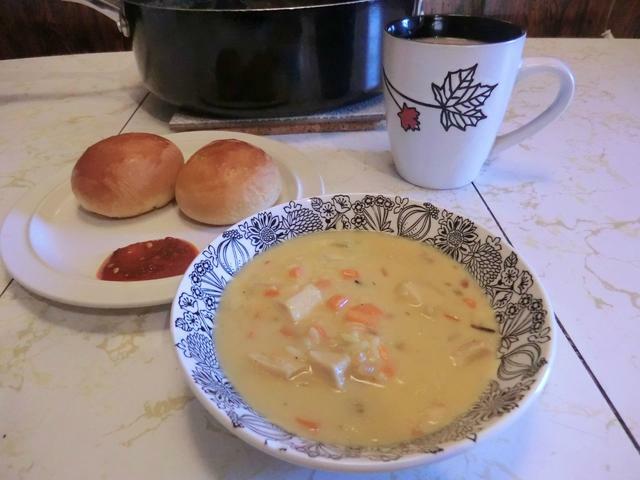 The buns went well with a freshly made bowl of creamy turkey and wild rice soup. 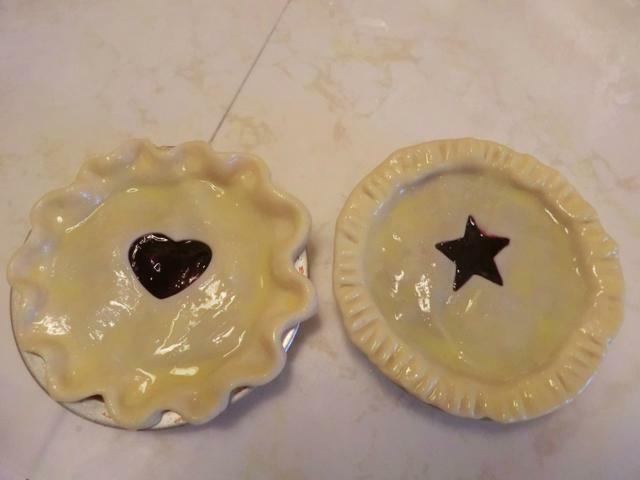 A few other goodies made this month: Raisin butter tarts and a couple of mini pies, coconut panna cotta with a blueberry sauce or a simple apricot jam base and a quince paste garnish. 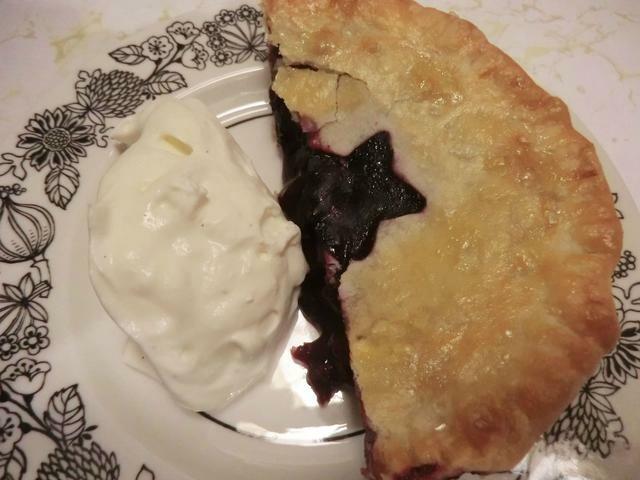 I used the extra blueberry sauce for a filling for a couple of blueberry-raspberry mini pies. 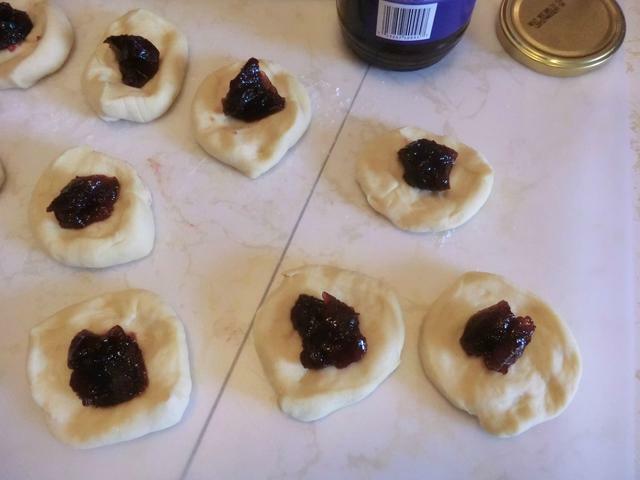 The filling for the fruit pies was thickened with a cornstarch slurry and cooked together with a handful of frozen raspberries before being allowed to cool. 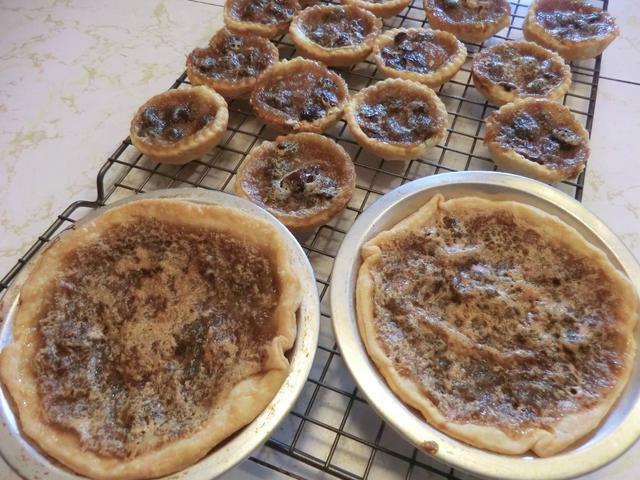 The pastry for the tarts and pies were made with Tenderflake lard pastry from the freezer. 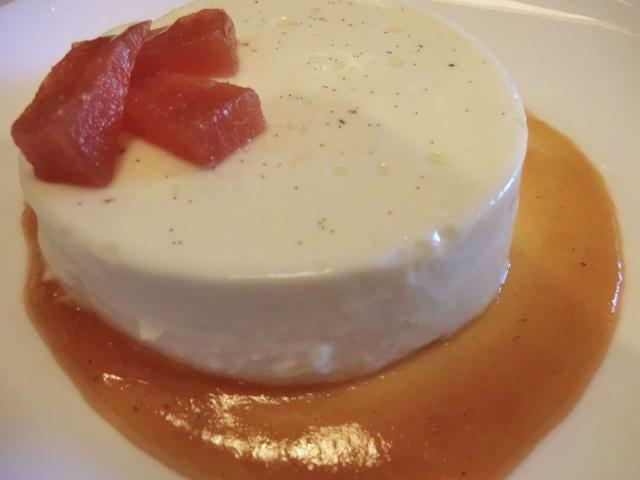 And lest you think it was all about the sweets … here are some other tasty dishes. 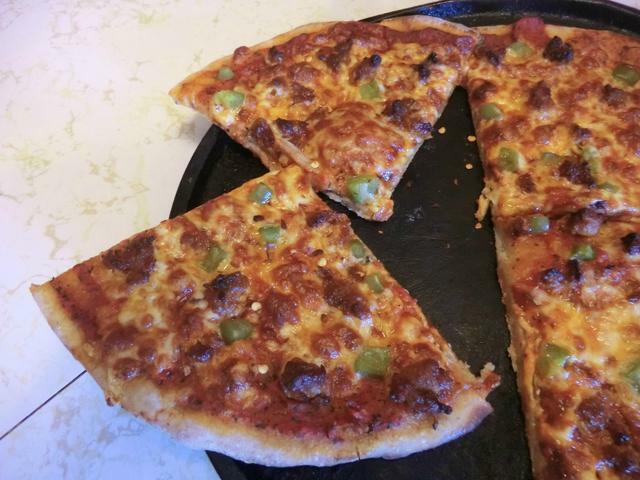 And then, there’s always a pizza or two. In this case, the last of the whole wheat sourdough dough from my freezer. 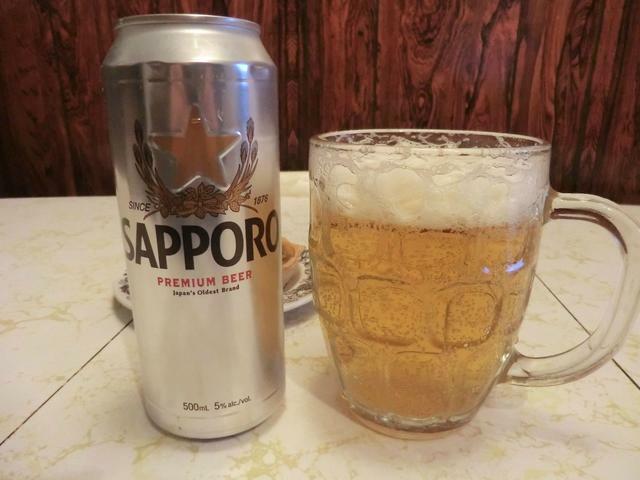 Washed down with a refreshing beer, in this case a Japanese Sapporo. 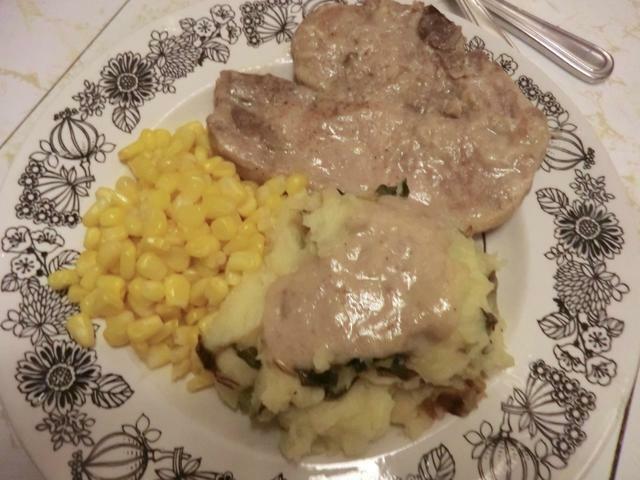 I’ve cooked pork tenderloin in several ways before this and, although they were delicious, I wanted to try something different. 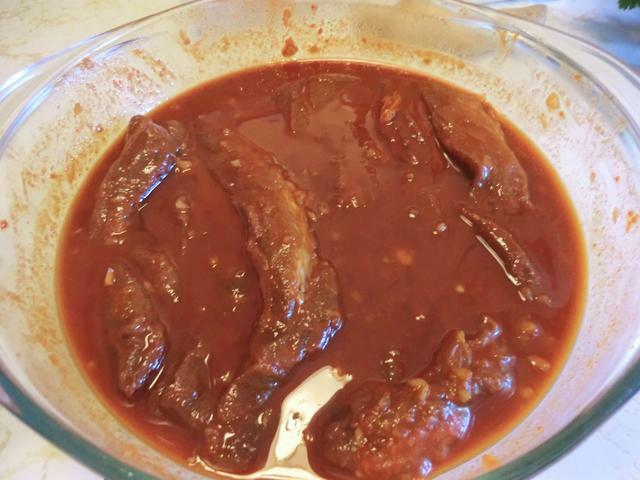 So, I went in a Korean direction and marinated a couple of butterflied tenderloin in a mixture containing the spicy chili pepper paste, “gochujang”. Since it’s such a lean piece of meat, overcooking has to be avoided carefully or the result will be dry. 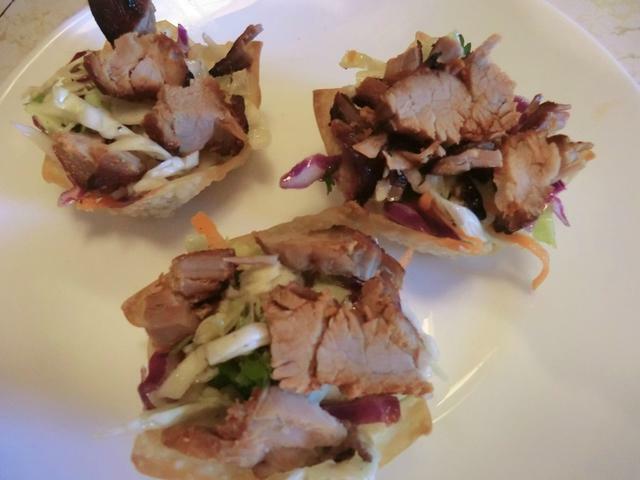 I was going to make lettuce wraps with the sliced meat but I forgot to buy the lettuce, so I used some leftover wonton ‘cups’ from my freezer. The result would make a lovely appetizer. In a large bowl, whisk together the gochujang, vinegar, soy sauce, honey, garlic, and fish sauce until it is totally combined. Butterfly your pork tenderloin so that it can open like a book, and is about 1 1/2 inches thick. 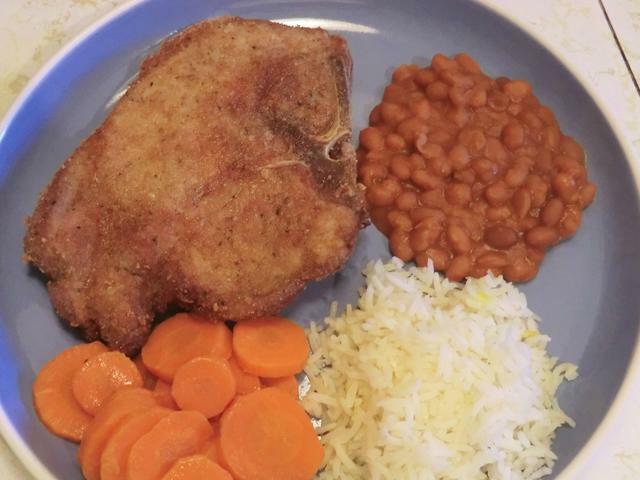 Season the pork with a good pinch of salt. 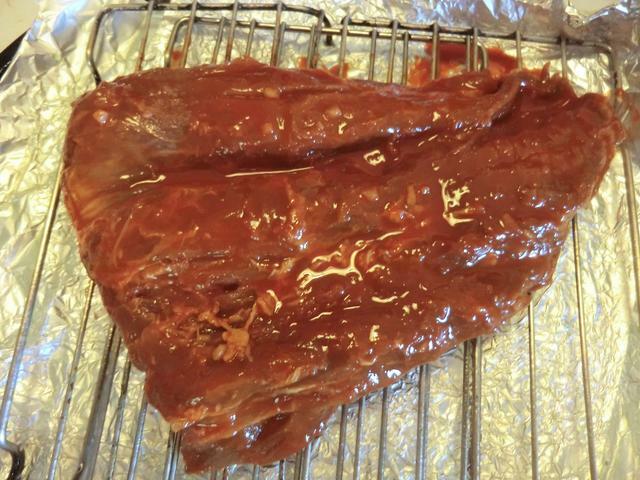 Place the marinade in a large Ziplock bag, and place the pork into the bag. A large bowl with a lid is another option. Marinate the pork for 12-48 hours. 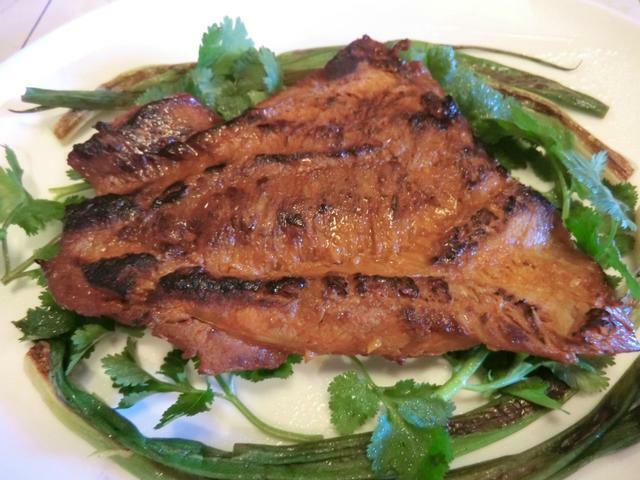 When your pork has marinated, prepare a grill or grill pan over medium-high heat. (You can broil the tenderloin in the oven if it’s too cold to grill outside or you don’t have a grill pan.) 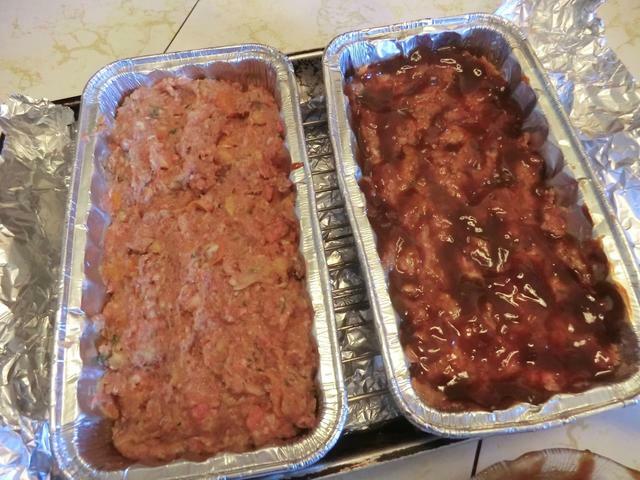 Pull the pork from the marinade, and reserve the marinade to the side. NOTE: If you want to use the marinade as a sauce, place it in a saucepan and bring to the boil. Cook for several minutes. Pour some into a separate bowl so you can use some of this to baste the tenderloin while it’s grilling and not contaminate your sauce with any raw meat juices. 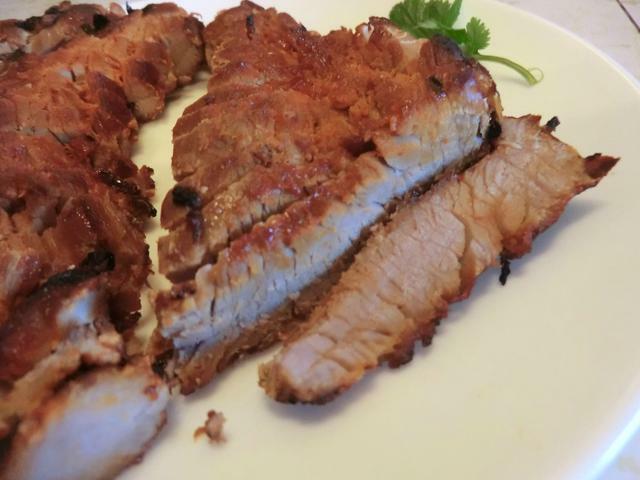 Grill the pork tenderloin, flipping it occasionally and basting with the reserved boiled marinade, until the pork is just cooked through and is no longer translucent at all in the center. Remember, your pork will keep cooking when removed from the grill. 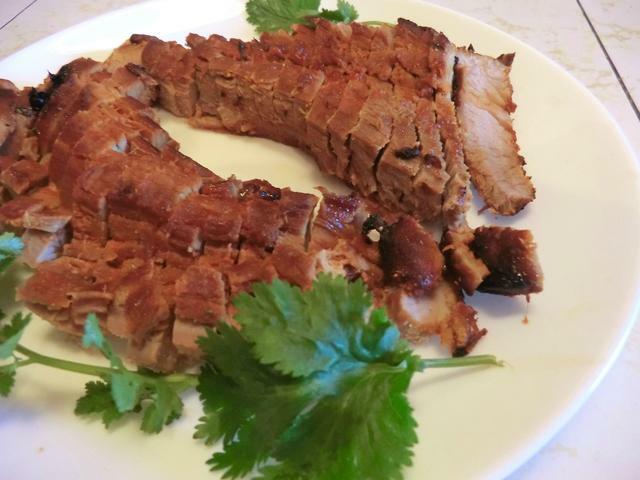 Let the pork rest for 5-8 minutes, and then thinly slice across the grain and on the diagonal using a sharp knife. Serve the slices fanned out on a platter atop the cilantro leaves and stems, and pass extra gochujang for dipping on the side. 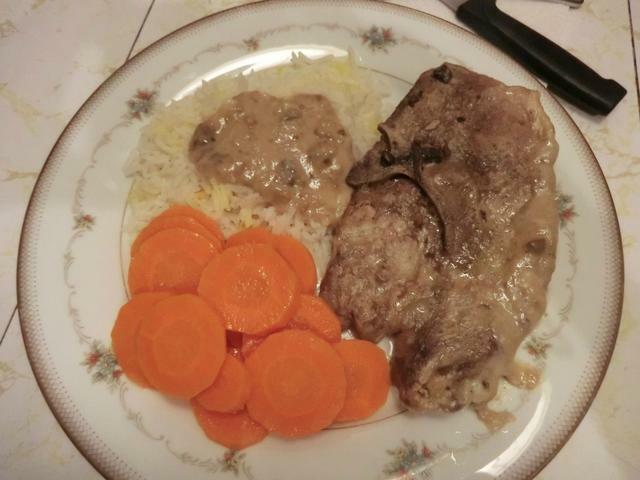 You may also serve the pork over plain cooked rice, dressing the meat with some of the cooked marinade. 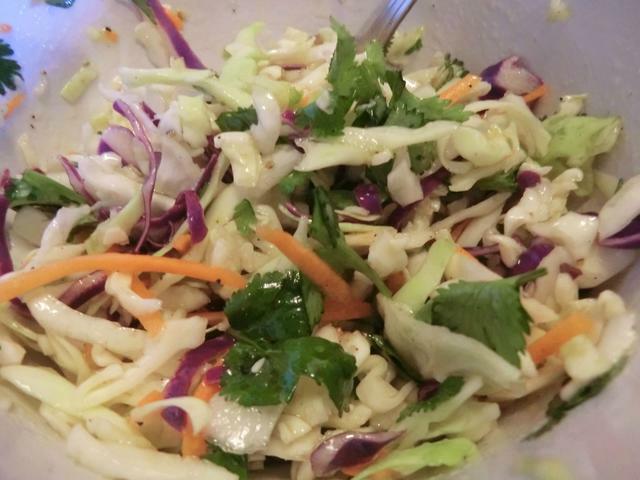 For the ‘lettuce’ cups, make this quick and tasty pickled coleslaw. 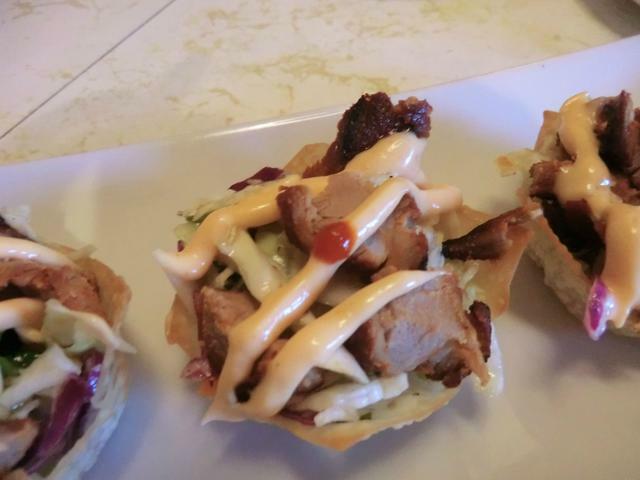 The pork tenderloin is also good in tortilla wraps or on buns. 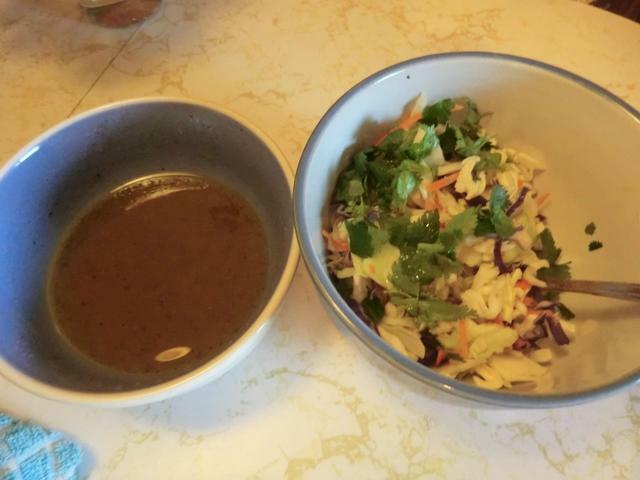 Whisk together the dressing ingredients and spoon over the coleslaw and cilantro leaves. Let sit for at least half an hour. For filling the cups, tilt the bowl so that the extra dressing drains off. 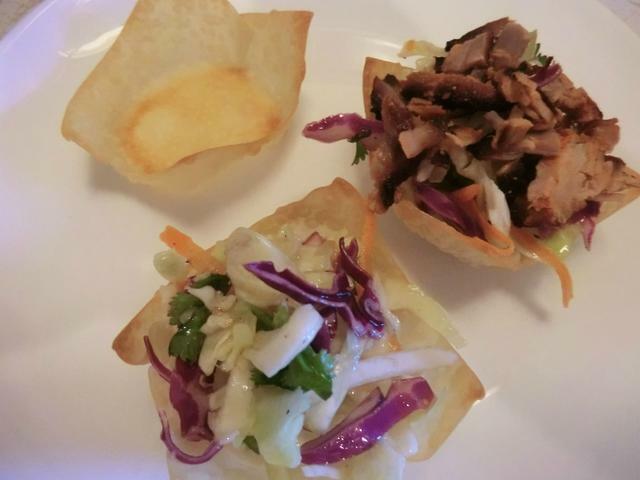 Spoon one or two tablespoons of the pickled coleslaw into each wonton cup. 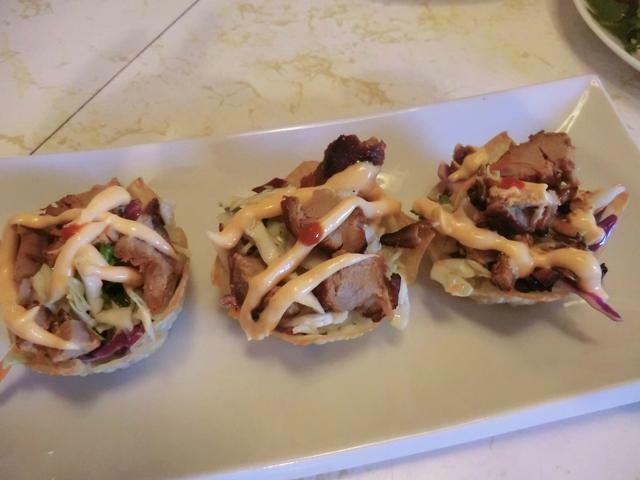 Add sliced pork tenderloin and drizzle some spicy mayo over the top. 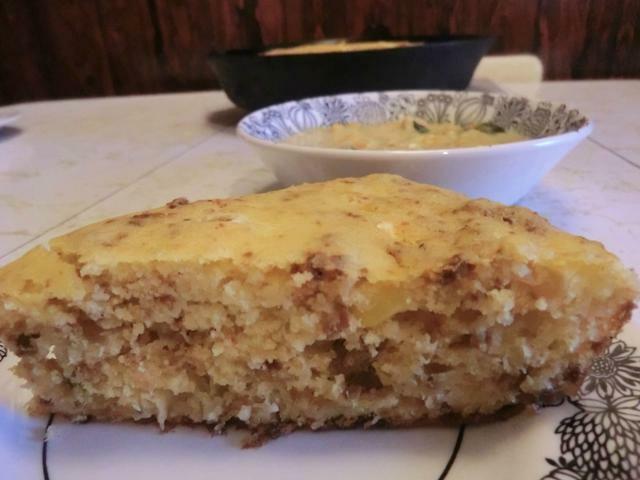 I’m trying to use my pantry ingredients to make meals without buying anything unnecessary. 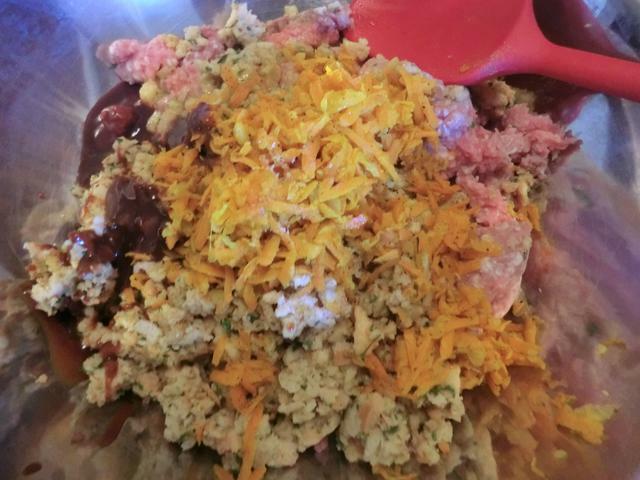 So when I wanted to use up a pound of regular ground beef from the freezer to make meatloaf, but didn’t have any celery in the house, I wondered if I could use a box of Stove Top stuffing as a substitute/ingredient. I asked around on my FB food groups and got lots of go-aheads. 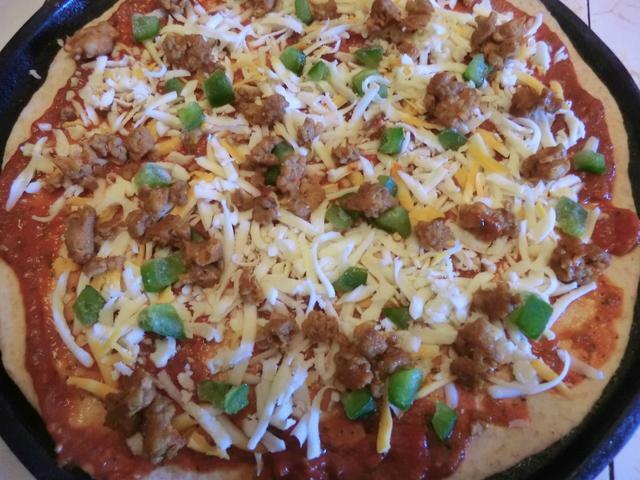 For the meats, I used a pound each of regular ground beef and lean ground pork. 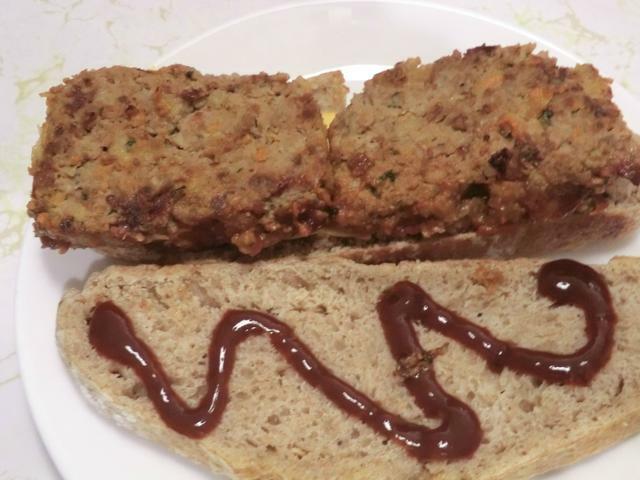 I didn’t have any mashing potatoes so I ate the sliced and browned meatloaf on sourdough wholewheat bread sandwiches. In a large saute pan, saute the onions and carrots in the vegetable oil until the onions are translucent and the carrots are tender. Transfer to a medium sized bowl and let cool to room temperature. 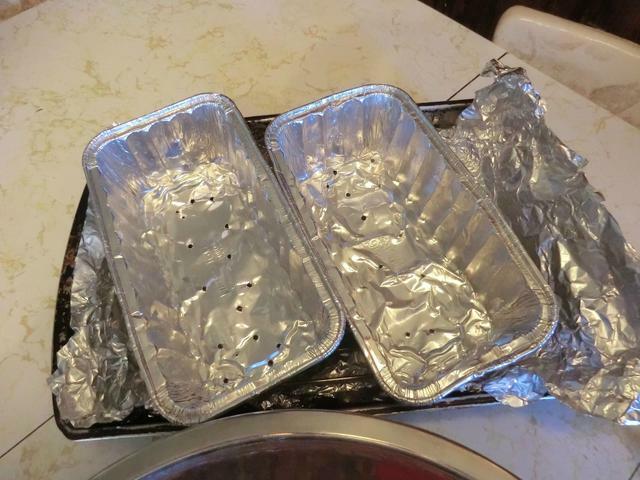 Pat into two 1 pound disposable aluminum loaf pans in which you’ve poked a dozen or so holes with a wooden skewers. 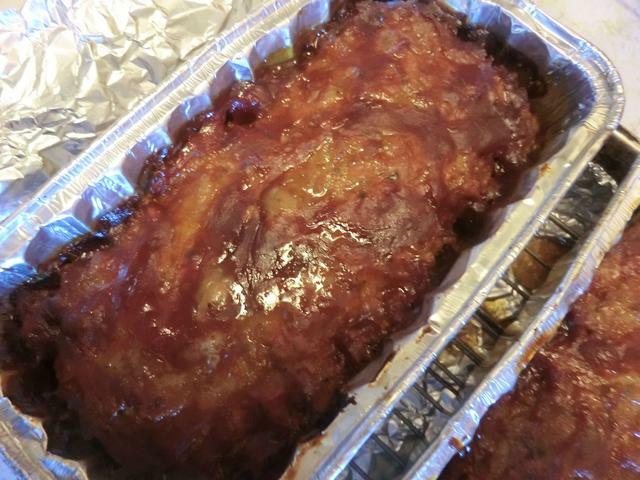 Place on a rack over a foil lined baking pan to catch any fat that oozes out. 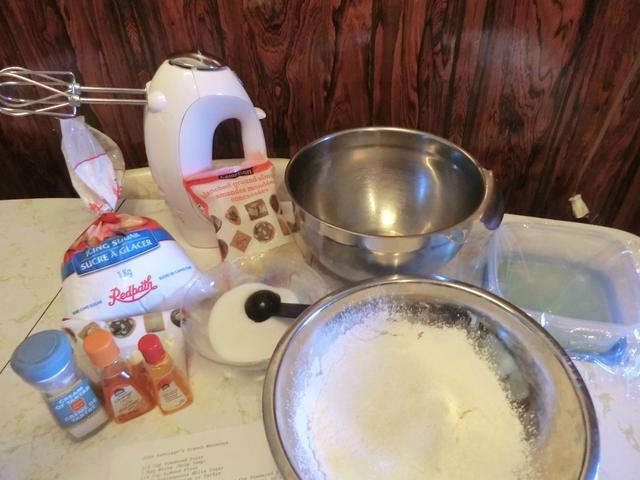 Mix glaze ingredients together and spread a thin layer on top. Bake for 1 hour (half an hour covered and half an hour uncovered) or until the middle is cooked through. Put under the broiler for a few minutes if you want a darker top. Let stand for at least 10 min to let the juices redistribute through the loaf before cutting. 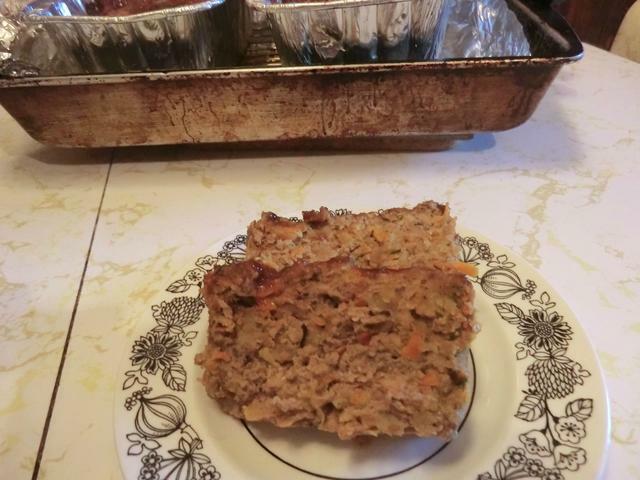 The result was a moist and flavourful meatloaf. My donuts come from a local bakery these days cause I can get just ONE and it’s a nice treat when I’ve had a bad day or week. I’ve made them myself but, as always, frying keeps me from making them too often. 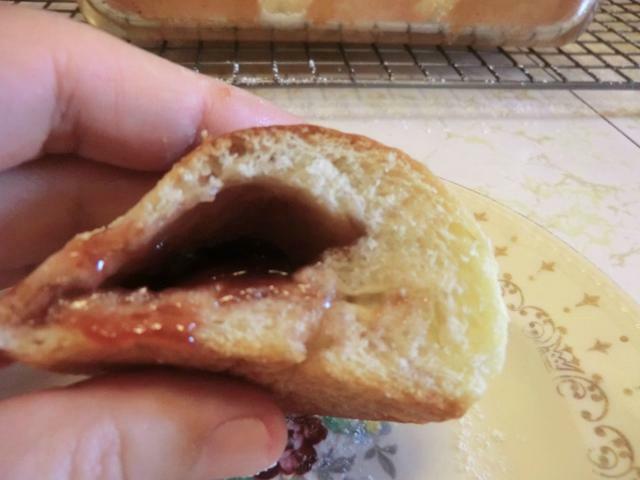 So, a recipe for a baked donut seemed too good to be true. And I don’t mean those cake-y horrors but REAL yeast donuts. 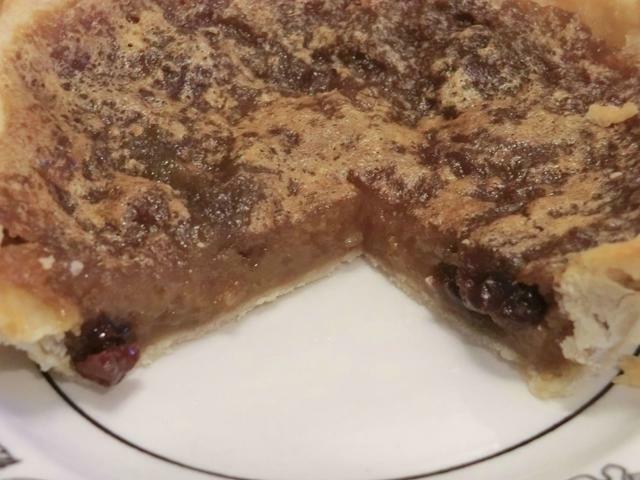 The link to this Austrian version came from a recommendation made by a visitor to her baked donut post, while the 2nd recipe is Zsuzsa’s creative adaptation/modification. South-western Ontario is a major producer of field crops ranging from tobacco to soy beans and tomatoes and vineyards abound as do orchards filled with apples and pears. 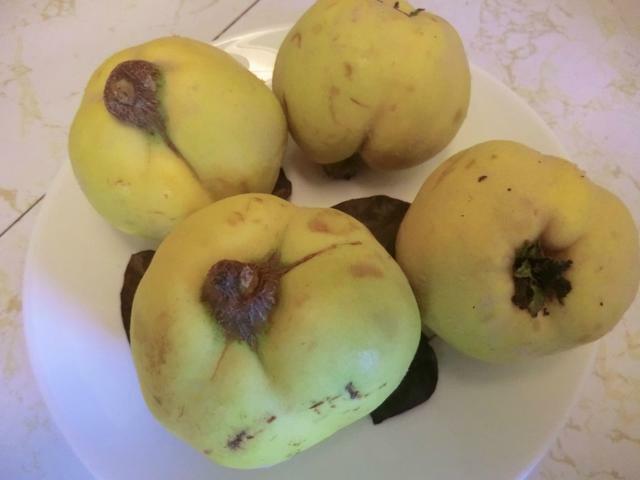 Less commonly found are quinces which combine elements of both apples and pears. Unlike these two however, you can’t eat quinces out of hand. 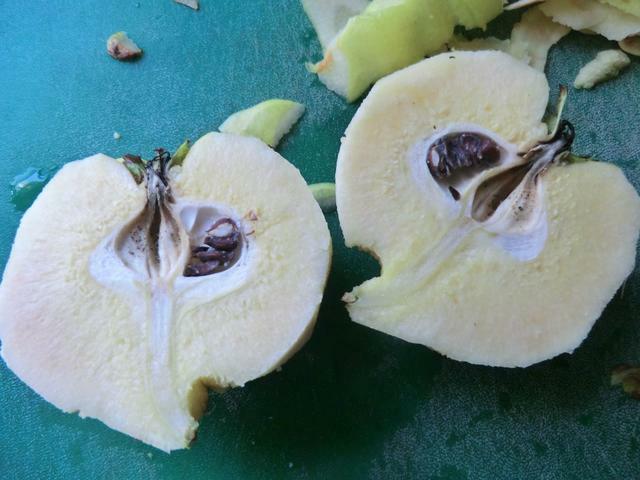 Baked or boiled/poached, the tannic creamy pale fruit turns into a tender pale pink fruit which can be used in pies, on tarts and processed into jam, jelly or a thick paste/cheese. 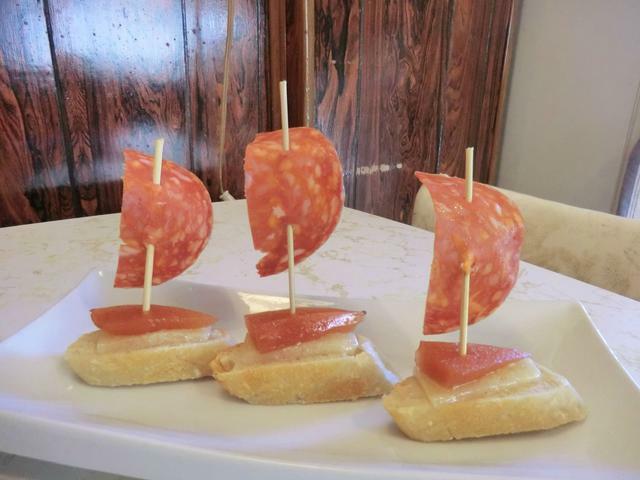 The latter is known as membrillo in Spain where it is served with an actual cheese, Manchego, especially as part of tapas or pinchos. It’s also popular in Italy, Portugal, Mexico as well as a number of South American countries. 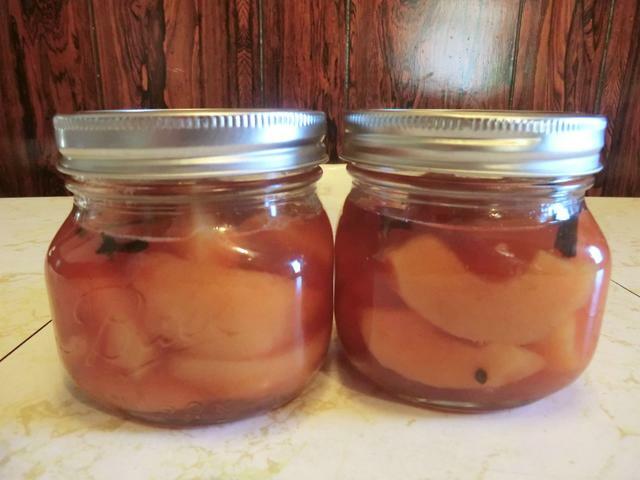 Years ago I baked quinces and served them with a scoop of vanilla ice cream but a recent purchase of the fruit led me to be a bit more adventurous. 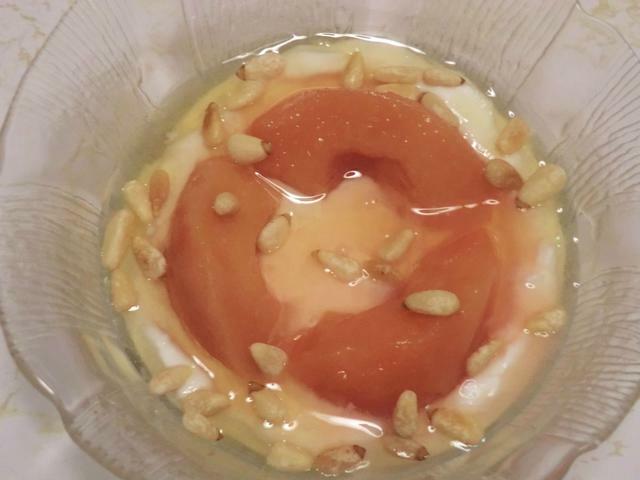 Poaching the fruit in a spicy sugar syrup which contained lemon juice/sliced lemon, whole cloves, star anise and vanilla pods resulted in a delicious dessert when served over drained yogurt with a drizzle of wildflower honey and a scattering of toasted pine nuts. 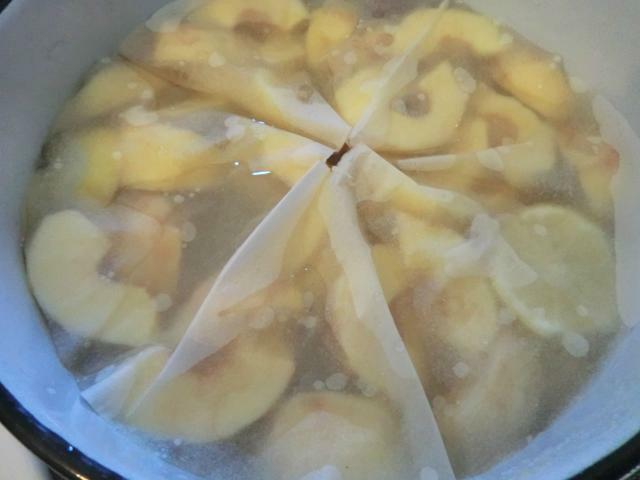 Putting a parchment lid on the sliced fruit in the poaching liquid and weighing it down with a plate helps to submerge the fruit so as to cook it until it’s tender. 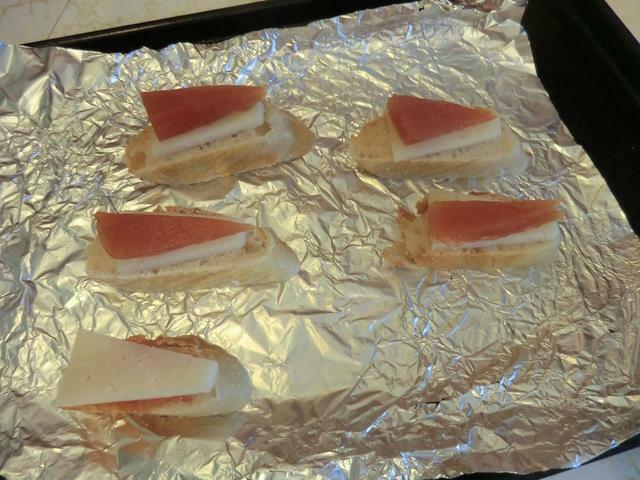 I transformed some of my poached fruit into quince paste or membrillo. 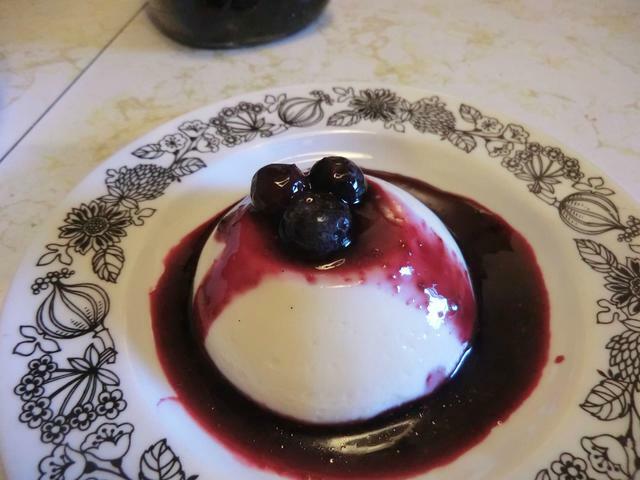 I didn’t want to stand over the stove for an hour or so stirring the pureed fruit until it thickened, so I threw the fruit and sugar into a microwave safe bowl and cooked it until it darkened in colour and thickened, stirring every couple of minutes. 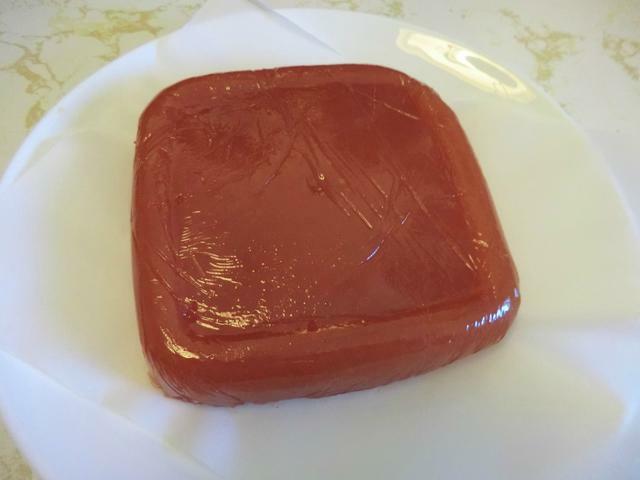 I poured the mixture into a plastic wrap lined container and let it set until firm. 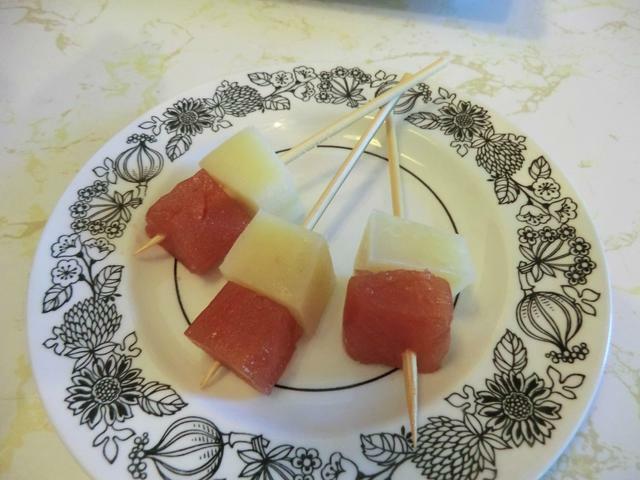 The paste can be cut into wedges or cubes and turned into appetizers. I’m not much of a drinker but I DO like a cold beer with a bbq or a Tex-Mex meal. I prefer light beers like Tecate or Sapporo/Asahi but I’ve enjoyed a stout or two in the past. (Just half a pint though cause it’s a pretty rich drink.) 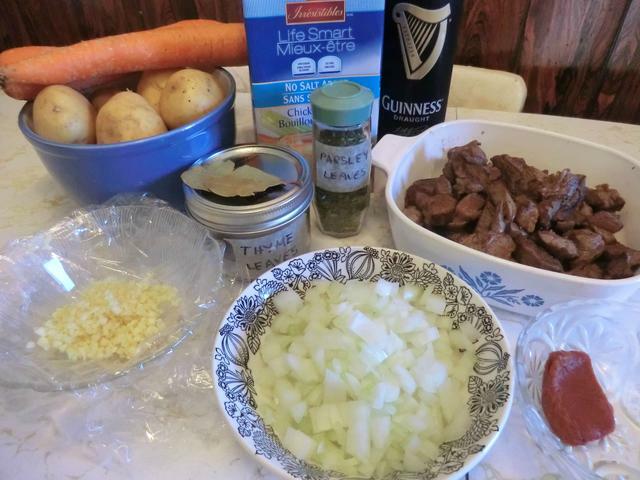 Over the years, I’ve seen those recipes for beef stews and steak and kidney pies using Guiness and been tempted to give them a try. 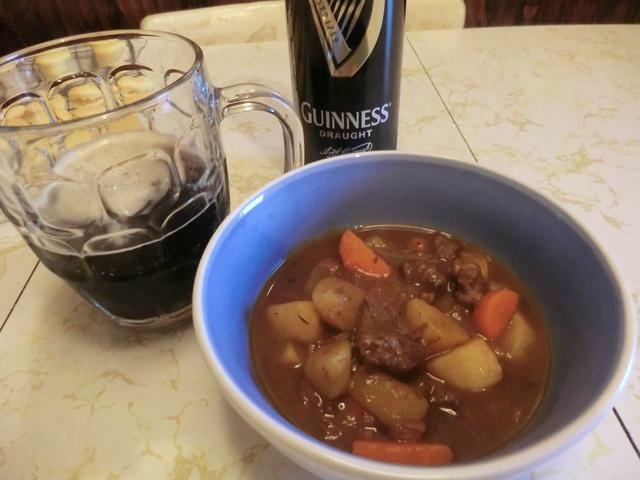 This past Friday I picked up a can of Guiness draft beer and made a pot of stew with some blade steak. Heat 1 tbsp olive oil in dutch oven over medium-high heat. Add half the beef and saute until brown on all sides, about 3-5 minutes. Remove to a large bowl and reserve. Add a second tbsp of olive oil to the dutch oven, the rest of the beef, and brown. Remove to the bowl with the rest of the sauteed beef and reserve. Add the onion and garlic to the oil in the dutch oven and saute for a couple of minutes. If needed, add a bit more of the olive oil. Add the tomato paste and saute for 1 minute. Add the browned beef, beef stock, Guinness, bay leaves, thyme and parsley. Add salt and pepper. Stir to combine. Add the potatoes and carrots and continue simmering until vegetables and beef are very tender, another 30-40 minutes. Check periodically to make sure the meat and veggies are submerged. Discard bay leaves. Tilt pan and skim off any fat if your meat was very fatty. Salt and pepper to taste. Uncover for the last 10 minutes or so if you want your stew to thicken up. Transfer stew to serving bowl. (Can be prepared up to 2 days ahead. Cool slightly. Refrigerate uncovered until cold, then cover and refrigerate. Bring to simmer before serving.). 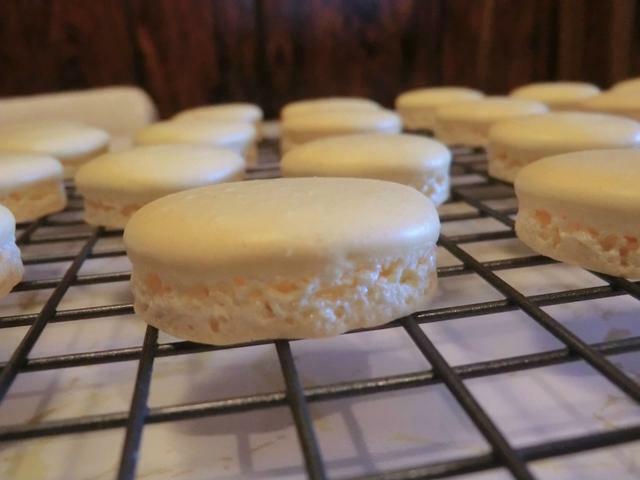 And, since I had a couple of egg whites left over from making Saturday’s sugar cookies, which I ‘aged’ overnight on the counter, I made a second try at French macarons. 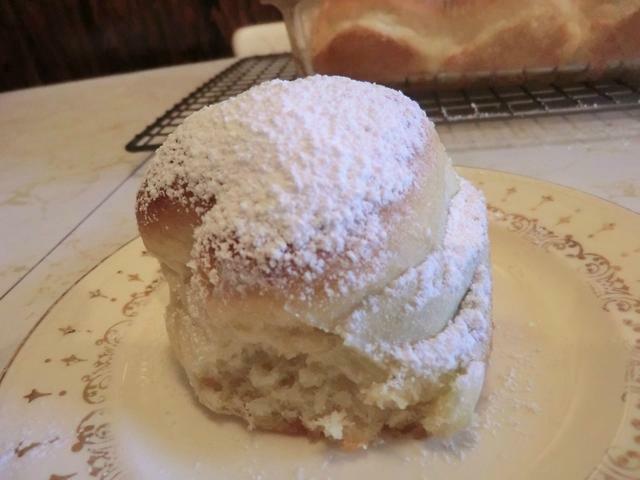 Combine the icing sugar with the almond flour. Sift twice to remove any big pieces of almond. Grind them in a food processor if necessary. In a large, clean bowl, add the egg white/s and beat until frothy. Add the cream of tartar. Add, regular white sugar, 1 tbsp at a time, until soft peaks form. If using food colouring and flavour, add with the last of the sugar and continue beating until you get stiff peaks. Add powdered sugar/almond flour to the egg white mixure. Start with 1/4 of the mixture. Stir in and then fold the rest into the lightened egg white. Stir around the edge of the bowl and fold into the middle. Repeat 20-30 times or until your mixture flows smoothly when dropped from 5-6 inches. Pipe mixture onto parchment paper through a 1/2 inch round tip. 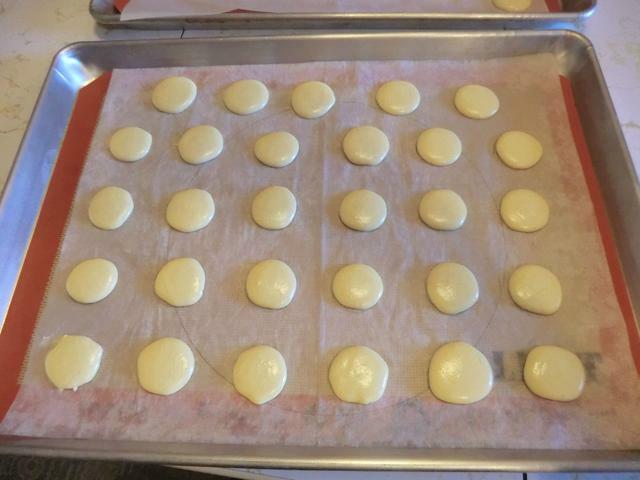 (You may want to trace a pattern on the underside of your parchment paper as a guide to the size of the macarons so they’ll be uniform.) 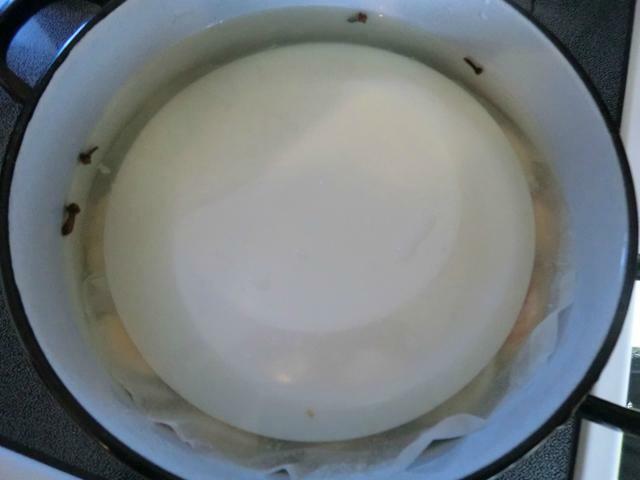 Tap pan a few times to get rid of air bubbles, then LET SIT FOR AT LEAST 30 MINUTES! until the outside of the disc is dry to the touch. 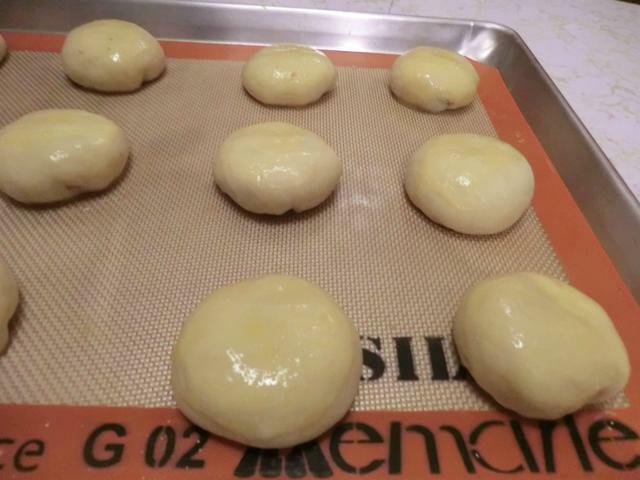 Preheat oven to 300 deg F.
Remove them from the baking tray immediately when they come out of the oven. You can run a small offset spatula under them to make sure no areas are stuck and then place them on a wire rack to cool. 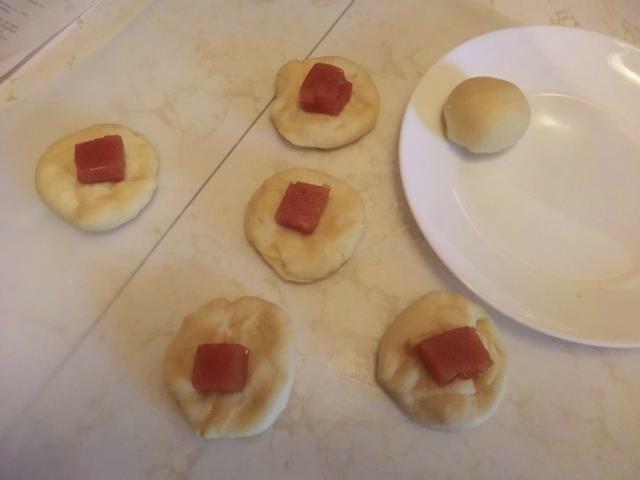 By removing them immediately from the hot baking sheet it stops the cooking process so they don’t over cook and become hard. You want them to be crisp on the outside and soft and chewy on the inside. The stew was an unqualified success. 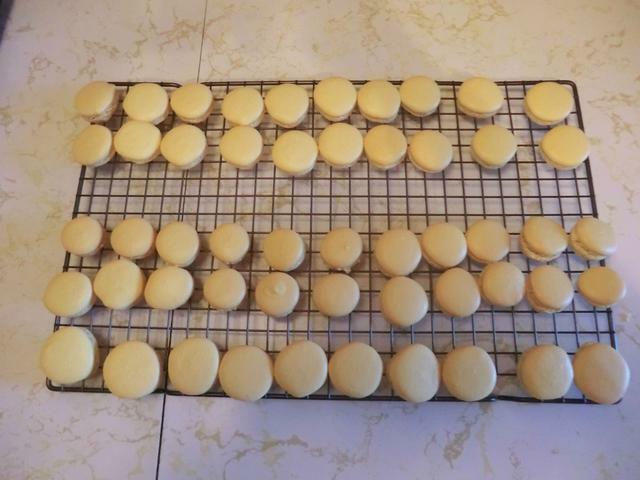 The macarons less so as I still have to work on the timing of the addition and type of food colouring for the macarons. Liquid food colouring, added after you’ve beaten your egg whites to stiff peaks, will result in over beaten and hollow macarons. And overbaking will give you dry, hard centers. 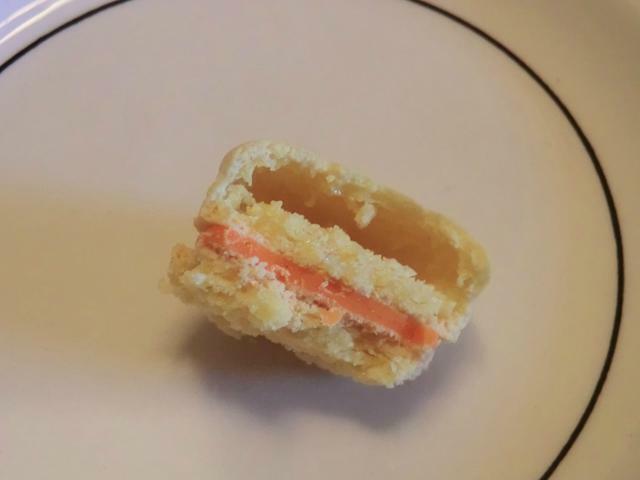 You can see those errors in this macaron. Next time I’ll invest in gel or paste food colouring and add it with the granulated sugar. 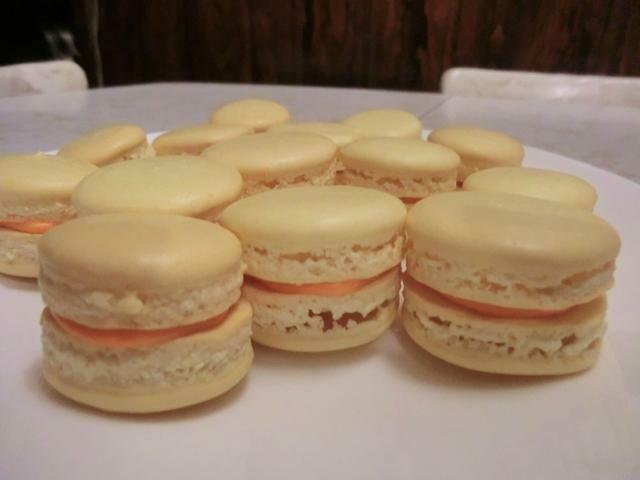 Even so, this batch of macarons were much better than my first attempt and I can tentatively check it off my food bucket list. I filled my macarons with melted chocolate as I hadn’t really PLANNED on success. 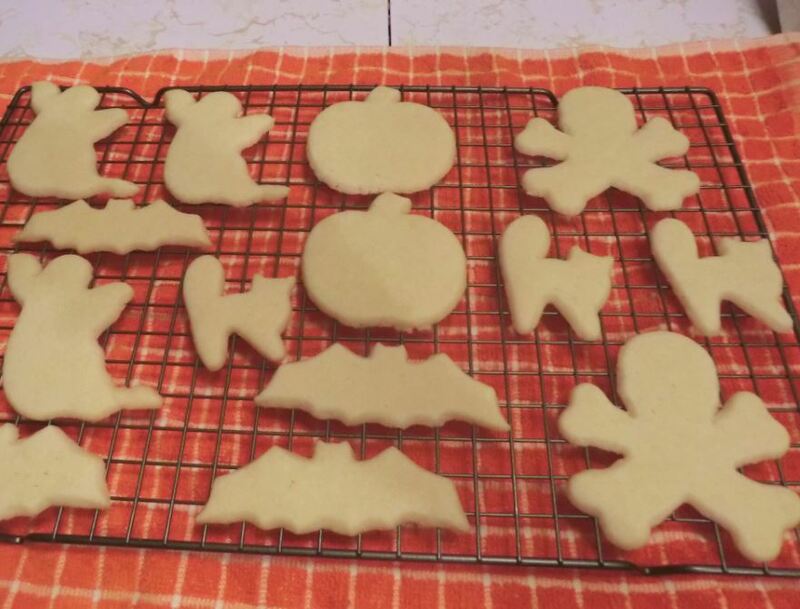 I made them with my usual sugar cookie recipe. Or you could have a really BIG cookie. I used my favourite chocolate chip cookie recipe, pressed some white chocolate chips into the top, as well as some chopped up orange chocolate melts (Mercken’s brand). 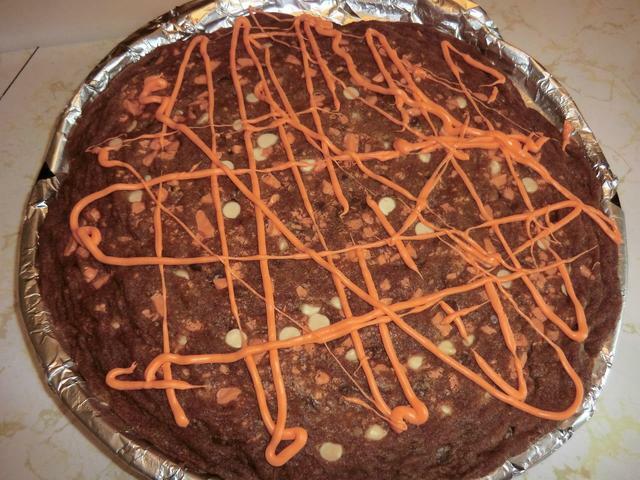 Use orange chocolate chips if you can get them. Bake at 350 deg F for about 25 min, or until the center is set. Let cool, and decorate with candy corn or any other Halloween decorations you have. I just melted some more chocolate and drizzled it over the top.